The Troy 12 Sided Rubber Encased Dumbbells 55-75lb Set TSD-055-075R is made from solid cast with a 12-sided anti-roll design and encased in virgin rubber, these Dumbbells are stylish as they are durable.They resists cracking and fading while protecting floors and equipment. 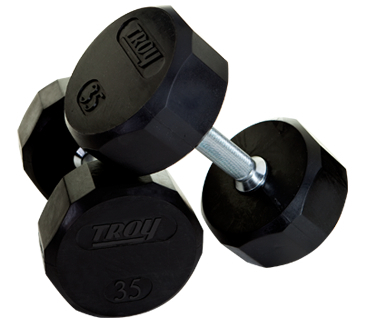 The Troy 12 Sided Rubber Encased Dumbbells 55-75lb Set TSD-055-075R has no strong odors and the heads are permanently affixed to a 30mm straight, medium knurled, single forged chrome handle utilizing a steel pin and exclusive bonding formula. No spinning or loosening. Heads are sized no larger than a pro-style Dumbbell in diameter, making it more compact and easier to control. Available in various sets: 55-75 lb, 55-100 lb, 5-50 lb, 5-100 lb, 55-75 lb, 55-75 lb and 105-120 lb; prices vary. Pairs come in 5 lb increments. 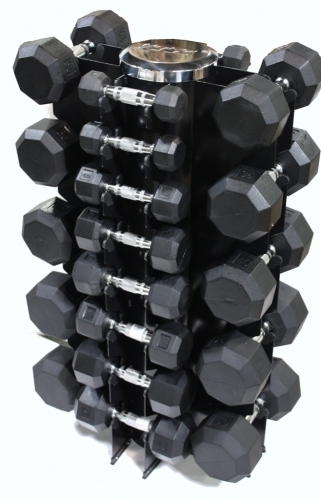 These Quiet Iron rubber encased Dumbbells are top of the line, absolutely the best bar none! Made from only the highest quality materials, our Troy 12 Sided Rubber Encased Dumbbells 55-75lb Set TSD-055-075R Dumbbells will stand up to the most strenuous of work outs. We make these Dumbbells with all steel chrome handles and only virgin rubber which helps reduce noise and protect floors and equipment. Perfect for any club, gym or home. Call 1-800-875-9145 to speak with one of our fitness agents about the Troy 12 sided rubber encased Dumbbells 55-75lb set. Order your Troy 12 sided rubber encased Dumbbells 55-75lb set from FitnessZone.com today! This set inlcudes a pair each of 55, 60, 65, 70 and 75lb Dumbbells. Order your Troy 12 Sided Rubber Encased Dumbbells 55-75lb Set from FitnessZone.com today!